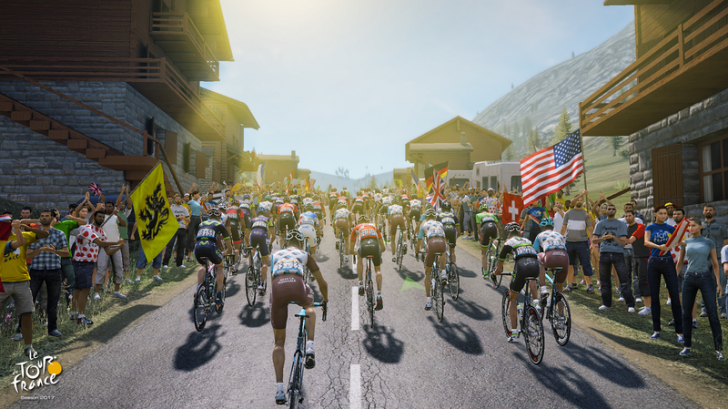 Tour mode allows you to take part in either the Tour de France, the Dauphine or the Triptyque Tour. On tour mode, you get the choice of controlling one of the twenty-two teams which are a part of the tour. Whilst playing this mode, you will earn experience points which will allow you to unlock more races as you progress. When loading up Tour mode you will get the choice of three modes: Solo, Co-op and Versus. Unfortunately the Co-op mode is only available for split screen and is not online Co-op, as that might have added a bit of competition to the races. After you have selected the mode you would like to play on, if it is your first time you will be asked what difficulty you would like to play on between amateur, professional and champion. Once you have selected the difficulty, the tour and the team you would like to play as, you can get straight into races. However, I would advise you to do a tutorial/training first to get the hang of the game. The Challenge mode is pretty much self-explanatory. When you load into this mode you will be given the choice between solo and versus. After selecting your mode of choice you will then be greeted with a series of challenges. The challenges ask you to do a certain distance in a certain time. Completing it in a certain time gives you a medal depending on your performance. As you complete the challenges, more will unlock. My Tour is a mode that allows players to create their own race, but with a catch. You can only use the stages that are in the game. This means that the creativity options available are very small, but you could still have some fun with it. I never got to play about with this mode, however I presume it would be fun if you had completed all the races in the game. Training is the first mode I would advise you to play. The Training mode is basically a tutorial that will run you through the basics of the game. As you progress further into the Training you will learn little tips and tricks which will help you get an advantage over your opponent, such as how to manage and maintain your energy. Training mode helped me a lot, as a newcomer to the game, since it ran down everything I needed to know to stand a chance at winning races. Tour de France 2017 offers quite a lot of content with both Tour and Pro Team offering plenty of races each before you even have to consider creating your own. However, this game is incredibly tedious and boring. In a Tour race, you are looking at nearly 40 minutes before you have even finished one race. As you can imagine, after completing one race, you are about fed up of the game and decide to go and play something else. Another issue with the game is the graphics. I’m aware that games aren’t all about the graphics, however for a game that is released in 2017, it has the graphic quality of a game released in around 2009. As you are racing through villages, the people cheering you on look like little blurred people, and the trees and houses look like something from an old cartoon. Although this game offers plenty of content (which is good in a game), you just don’t receive the excitement to go and play another race straight after, so the amount of content ends up being worthless since you don’t want to play it all. With the time I had with the game, I didn’t get the same amount of joy as I would playing another game, or sports game in this instance. I would only recommend this game to people who are either big fans of the Tour de France game series, or big cycling fans, otherwise you would probably be wasting your money.